Removals, Man and Van, Storage, Office Moves and House Clearance in the St Albans postal district. Allen & Young Removals and Storage are pleased to be able to offer the full range of our Removals, Packing, Man and Van Hire, Storage, House Clearance and a range of Business Moving Services to Most St. Albans Postal Districts and Most of the following postcodes: AL1, AL2, AL3, AL4, AL5, AL6, AL7, AL8, AL9 and AL10. Allen and Young are a professional removals company and we carry out all moving and relocation services including household removals, domestic removals, domestic moving, home removals, home moving, house removals, house moving, flat removals, flat moving, apartment removals, studio removals, office removals, business removals, student removals, landlord removals, short notice removals, overseas removals, antique removals, furniture removals, removal vans, light removals, mini moves, mini removals, small removals, small moves, cheap removals, budget removals, quality removals, van removals, part loads, man and van removals, man and van, man and a van, van and man, man and van hire, van and driver, van and driver hire, storage, domestic storage, household storage, business storage, short term storage, long term storage, packing, household packing, delicates packing, house clearance, landlords clearance, landlords disposal, office clearance, probate valuation, rubbish removal, rubbish disposal, furniture disposal, furniture recycling. If you need a remover, a man and van, some storage, packing or house clearance in the St Albans, simply call or email Allen and Young today.. Please click in the list below for further information. 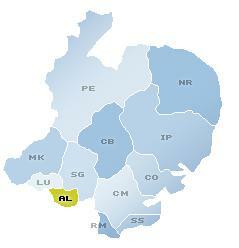 About the St Albans postal district. The AL postcode area, also known as the St Albans postcode area, is a group of ten postal districts in central Hertfordshire which are subdivisions of five post towns and comprise the poat codes AL1, AL2, AL3, AL4, AL5, AL6, AL7, AL8, AL9 and AL10. Allen and Young Ltd carry out all moving services including removals, man and van, storage, packing and house clearance in the St Albans area.